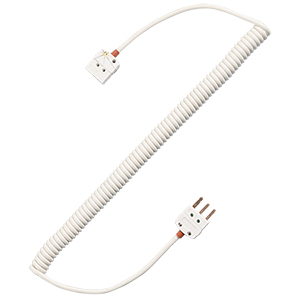 Omega offers various RTD extension cables for interconnecting RTD sensors with instrumentation. They come in either straight or retractable coil configurations,with glass braided or PFA insulating jackets. The retactable coil cord cables come in either 1 foot or 4 foot retracted lenghts that can stretch to 5 feet or 20 feet respectively.Ten termination types are available. RETRACTABLE SENSOR CABLE, MTP MALE/FEMALE CONNECTORS,1 FOOT RETRACTED LENGTH. RETRACTABLE SENSOR CABLE, TA3 MALE/TA3 FEMALE CONNECTOR, 4 FOOT RETRACTED LENGTH. STRAIGHT SENSOR CABLE,OTP MALE/FEMALE CONNECTORS, 10 FOOT LONG GLASS BRAIDED CABLE. 참고: Note: Retractable cables are expandable 5:1. One foot will expand to 5 ft. length. Note: PFA coated wire extension cables are constructed from 24 gage wire.